ok so i did it. i know i shouldn't have done it and i know that i am too old for this sort of thing but there we go. 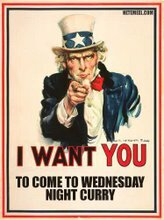 I also created a little group on it as well guess what it ios called - yup wednesday night curry! Anyways i have not even sent the e-mail out yet as i have been to busy. Better get on to it now.